These are replacement screws, nuts, and hanging loops for vintage era (two screw type) Revere Ware pan handles. Please use the information below and the pictures to make sure they will fit your handle before you buy. 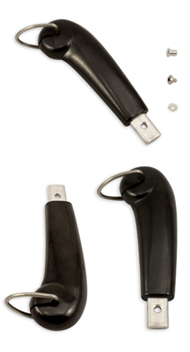 These parts are newly manufactured by reverewareparts.com and are made to look and work just like original Revere Ware hardware, with the exceptions noted below. Fits: Vintage era small Revere Ware pan handles (definition of skillet, pan, etc. here). 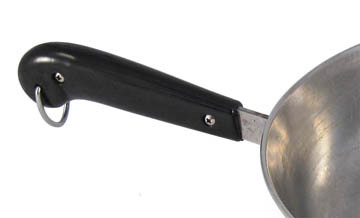 These fit Revere Ware pans with handles that have two screws through the Bakelite. the larger handle sizes or the single screw newer handle. If you think you have a small handle, please compare it with the measurements of our small handle to make sure you are purchasing the correct hardware set. 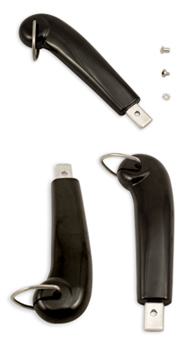 In our experience, about 1% or less of handles will require this hardware set. 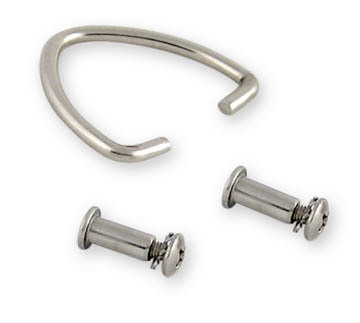 The screw and barrel nut in this hardware set are a different thread pattern than original Revere Ware hardware and are not interchangeable with original hardware parts.